The Department of English in the College of Arts and Sciences will present a mini-residency by Evan Gottlieb, a leading British literary scholar, on April 16-17. An associate professor of English at Oregon State University, Gottlieb will discuss “Speculative Romanticisms: Schelling, Coleridge and DeLanda” on Thursday, April 16, at 5 p.m. in the Hillyer Room (room 606) of Bird Library. The following day, he will lead a workshop on academic multi-format publishing at 2 p.m. in room 406 of Newhouse I. Both events are free and open to the public. For more information, contact Erin Mackie, chair and professor of English at esmackie@syr.edu. “[Thursday’s] lecture will sketch an alternative genealogy of Samuel Taylor Coleridge’s intellectual and poetic development—one that reads some of his best-known poetry in dialogue with the materialism of his own day, before considering its surprising resonances with heterodox Deleuzian materialism,” Gottlieb says. A scholar of British literature of the “long 18th century” (c. 1688-1815) and a critical theorist, Gottlieb is the author of three books: “Romantic Globalism: British Literature and Modern World Order, 1750-1830” (The Ohio State University Press, 2014), “Walter Scott and Contemporary Theory” (Bloomsbury, 2013), and “Feeling British: Sympathy and National Identity in Scottish and English Writing, 1707-1832” (Bucknell University Press, 2007). He is currently working on two book projects: “Romantic Realities: British Romanticism and Speculative Realism” (under contract with Edinburgh University Press) and “Engagements with Literary and Critical Theory” (under contract with Routledge). 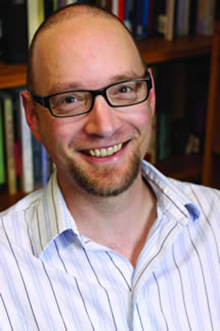 Gottlieb also serves on editorial boards of several journals, teaches at the Michigan-based Global Center for Advanced Studies and writes about literature for The Huffington Post. He earned Ph.D. and master’s degrees from the University at Buffalo.